So you're ready to start racking up frequent flier miles and book around the world first class flights for mere dollars? Before jumping head first into the world of miles and points, it's important to take some time to think about what your travel goals are and research the best way to get there. The good news for you is that we were just in your shoes not that long ago, and we hope that all of our research will help you to make sure you end up with the best credit cards for your specific travel goals as well as understand how to start forming your own long-term approach that keeps your mileage accounts high without accruing any debt. I assume that most of you have a vague idea of why it's beneficial to be proactive in collecting miles and airline perks through credit cards, but for those of you that don't, here's the quick version: Travel credit cards has the potential to give you huge amounts of "free" points that can be used for flights, hotels, perks, and cold hard cash. Credit card issuing companies want to entice as many people as possible to sign up for their cards in the hopes that they will carry a balance and pay interest to them. In order to do this, many of them partner with various air and hotel brands (or just simply offer their own card) and offer pretty substantial sign up bonuses. And as long you know how to play the game, travel credit cards can be a very lucrative way for you to travel. Sign-up bonuses — This is the most obvious one, and while it certainly shouldn't be the only thing you look for, it's a good place to start. It's also the easiest way to jump start your mileage collection, with some bonuses being high enough to earn you multiple free flights. There are two big things you should pay attention to when evaluating sign-up bonuses. First, most sign-up bonuses require more than just signing up. While some (and this is generally the exception, not the rule) only require you to make a single purchase, most will require a minimum spend in the first few months (more on this in a minute). For example, the AAdvantage Aviator card comes with a 40,000 mile sign-up bonus. To get this, you just need to make a single purchase in the first 90 days and pay the $95 annual fee. An example of the second type of sign-up bonues is the 50,000 points you get with the Citi Prestige card when you spend $3,000 in the first three months. Secondly, you should compare what the sign-up bonus is currently for a card, what it's highest bonus has ever been, and whether or not it's likely to go back up if you wait. The American Express Platinum card for example has a standard bonus of 40,000 points, however it's previously gone as high as 100,000 points through targeted offers and currently has a promotion where you can get 60,000 points. I know that you're excited about getting points, but the difference between 40,000 points and 100,000 points is the difference between a coach flight and a business class flight. It's worth the wait. The spending minimum — As mentioned above, most cards will require you to meet certain spending requirements in the first few months to actually get these bonus miles. While there are lots of ways to get creative in your spending to meet these requirements, your focus should be to meet any requirements with your normal day-to-day spending. If you spend more than you can pay back in a month, that balance you carry will require you to pay interest and the points are no longer free. I would recommend starting out small to make sure that you're comfortable paying off your balance each month before you look into some of the higher minimum spend requirement cards. Even better, start with a card or two that only requires a single purchase. Unfortunately, in order to get the great bonuses these cards offer, there is usually a required spending minimum. While there are ways to fake your spending, it’s best to be able to get the bonus using normal day-to-day spending. I typically sign up for cards with a minimum spending requirement of $1,000–3,000 USD in a three- to six-month period. My favorite spending minimums are the offers that require you to make one purchase in order to unlock the bonus! Additional spending bonuses — Just about every card will get you one point for every dollar spent, but the really good ones will multiply your dollars spent two, three, five, or more times. This can be a great way to rack up points quickly IF you're smart about which cards you use for what. While the first card you get will probably only multiply your spending on one or two types of purchases, your goal should be that eventually you have a well-rounded collection of cards that multiply your points for every single purchase you make. For example, the Chase Sapphire Preferred card will give you double points for travel and dining at restaurants, while the Chase Ink card will give you gives you FIVE TIMES your points for office spending, and the American Express Premier Rewards Gold card will give you triple points on airfare. We'll get into this more when we break down some of the top cards, but at the minimum you should be aware that each card you have probably has a bonus for at least one type of purchase. Special perks – This is where some of the elite travel cards can really separate themselves, and where you need to really think about what type of travel you're going to be doing the most of in the next year. Some cards will give you elite status with an airline, hotel, or car rental company, or travel benefits like free checked bags, priority boarding, free nights at a hotel, or access to airport lounges. One of the most popular travel credit cards today (which we'll go into more detail about below) is the Chase Sapphire Reserve, which on top of the bonus miles, gives you a $300 annual travel credit, Priority Pass Select lounge membership, a Global Entry or TSA PreCheck application fee credit, primary auto rental insurance, and trip cancellation coverage. While miles are important, travel perks are sometimes worth a lot more. Foreign transaction fees - This one depends on the type of traveler you are, but odds are, you plan on leaving the country. If not, you don't need to worry about this. If you're like us, then you want to avoid credit cards that charge a 3% fee when you use them overseas. This goes back to what we discussed earlier, that if you're paying anything more than you normally would, the points you're getting aren't free. Before getting into specific brand sponsored credit cards, a good place to start is with a credit card that offers you points that can be transferred to dozens of different airlines and hotels, or be used to book travel directly through their website. While many in the miles community consider this the little brother of one of the best travel credit cards available (more on that later), the Chase Sapphire Preferred is a great card to start with. Not only will you get 50,000 points after you spend $4,000 in the first three months, but you can also get another 5,000 bonus points by adding an authorized user and making a single purchase. You'll also receive two points per dollar on travel and dining at restaurants and your Chase Ultimate Rewards can be transferred to 11 travel partners, including United, Hyatt, Southwest, British Airways and others. You’ll also get primary auto rental insurance, trip cancellation coverage and no foreign transaction fees. Arrival Plus is one of the best rewards cards available for someone just getting into rewards points. Right now, you can earn 50,000 points after you spend $3,000 in the first 90 days, which is worth about $525 toward travel expenses. You can redeem these points to offset almost any travel-related charge, such as inexpensive flights or hotels where you don't have a miles card, Airbnb stays, or using rewards to cover the cost of award ticket fees. You simply pay for these charges (of $100 or more) with the card and apply miles to offset the cost in the form of a statement credit. Airline credit cards are a great way to get huge sign-up bonuses, as well as elite travel perks like free checked bags, priority boarding, and sometimes even lounge access. The biggest drawback to these cards is that their points must be used on their airline, or their partner airlines, so it's crucial that you pick one where the miles are going to be useful to you. Currently you can get 60,000 American Airlines AAdvantage bonus miles after $3,000 in purchases within the first three months of account opening. That's a nice jump from the normal 30,000 mile bonus. Additionally you will get preferred boarding and your first checked bag free on domestic American Airlines itineraries for you and up to four companions traveling on the same reservation. You’ll also get 10% of your redeemed miles back — up to 10,000 miles each calendar year — a 25% discount on eligible in-flight purchases and access to reduced mileage awards. Annual Fee: $0 the first year, $95 thereafter. The current offer of 60,000 bonus miles + $50 statement credit is another great bonus that's one of the largest the company has offered. To get the bonus miles, you'll need to spend $3,000 within 4 months of opening the account, and the $50 statement credit is yours when you make any Delta purchase within 4 months. If you've got some big purchases coming up this year, and plan on flying British Airways, this card has a huge potential bonus. You'll get 50,000 British Airways Avios after you spend $3,000 in the first three months from account opening, an additional 25,000 bonus Avios after spending a total of $10,000 in the first year from account opening, and another 25,000 Avios when you spend $20,000 total within your first year from account opening, bringing your account total to 100,000 points! You'll also get 3 Avios per dollar on purchases with British Airways and a Travel Together companion ticket when you spend $30,000 in purchases on the card in a calendar year. Like airline credit cards, these cards offer significant amounts of points that can only be used at these hotels and their partners. Where you really start to see the value (on top of the points) is in the additional benefits, such as expedited status and free nights each year. In most cases, the free nights cover the cost of the annual fee, making the points a pretty good bonus. You'll get 80,000 Marriott Rewards points after you spend $3,000 on purchases in your first three months, plus another 7,500 points when you add an authorized user and make a purchase in the first three months from account opening. On top of that you'll get 5 points per dollar at both Marriott and Starwood hotels, 2 points per dollar on airline tickets purchased directly with airlines, 2 points per dollar at car rental agencies and restaurants and 1 point per dollar everywhere else. You’ll receive 1 free night stay at a Category 1-5 location every year after your account anniversary date as well as 15 nights of annual elite credits which effectively gives you Silver status. 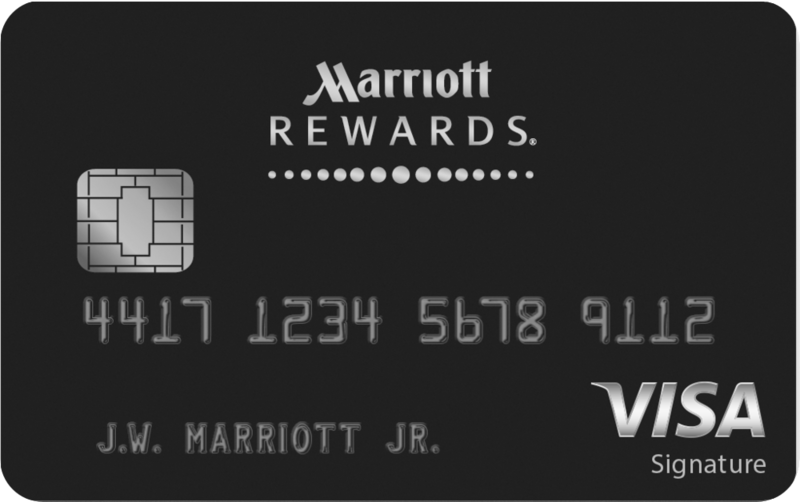 And thanks to Marriott’s RewardsPlus partnership with United, if you can make it to Marriott Platinum through a combination of hotel stays and this card’s elite credits, you’ll also get complimentary United Silver status as well. The Starwood Preferred Guest® Credit Card from American Express offers up to 5 Starpoints per $1 spent at participating SPG locations, 2 Starpoints per dollar at Marriott Rewards properties, and 1 Starpoint per dollar on all other purchases. Redeeming points for hotel stays provides the most dollars per point, but Starpoints can also be transferred to more than two dozen frequent flier programs. Plus, the card comes with a sign-up bonus: Earn 25,000 bonus Starpoints® after you use your new Card to make $3,000 in purchases within the first 3 months. If you're looking to get a glimpse of what luxury traveling is like, one of these travel credit cards is well worth the $450 or $550 annual fee. While that may seem like a pretty steep annual fee, the benefits you’ll receive from these cards can easily outweigh their costs. This card was even more appealing when you could get 100,000 points, but it's current offer of 50,000 Ultimate Rewards points after spending $4,000 in the first three months is still pretty good. You'll also get three points per dollar on travel expenses. What makes it worth the annual fee, however, is the $300 annual travel credit, Priority Pass Select lounge access, Global Entry/TSA PreCheck application fee credit, elite status with National and Avis car rentals, access to the Luxury Hotels Collection, and primary auto rental insurance and trip cancellation coverage. Annual fee: $450. NOT waived for the first year. This card comes with 50,000 Thank You Points when you spend $4,000 within the first three months, as well as a $250 air credit twice for the first year. You'll get three ThankYou points per dollar spent on air travel and hotel purchases, and two points per dollar on dining and entertainment. You'll get Priority Pass Select lounge access, Global Entry/TSA PreCheck application fee credit, travel and emergency assistance, trip cancellation and interruption protection and trip delay protection. While you don't get elite status with any other partners, the fourth night free at a hotel when you book four consecutive nights through its travel service is one of our favorite travel perks and can easily cover the cost of the annual fee. Let us know if you decide to get any of these travel rewards cards or if you think another card should have made the list.